Sketchfab's AR mode doesn't look good. Is there not a fix for this? Or do I have to move to Unity? 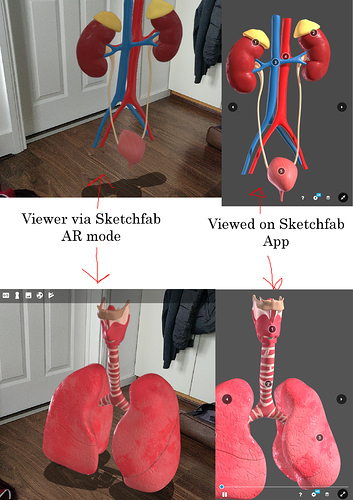 I tried Sketchfab’s AR mode, and although it looks ok, the lighting is not brilliant. This is the only post that mentions this issue AR Lighting Options , so am unsure if there is a fix. Is there any fix for this or will I have to move to Unity/Vuforia? In AR mode we change the lighting to use only the environment and add a light from above for the ground shadow. So all your static lights are ignored. We did this to avoid complex lighting settings to contrast too much with the AR scene and make it “unnatural”. You can try to boost your environment light intensity in the editor, and experiment with the settings.